Right smack dab in the middle of Downtown LA will be something you don’t want to miss in early August, a grand display of all things terribly wrong (which means it’s terribly right in Gothtober terms) in the name of jack o’ lanterns, vampire teeth, zombies and more! It’s the very first Los Angeles convention dedicated to Halloween! It’s SCARE LA!!! Rub shoulders with some of the titans of spooky special effects, learn how to turn your house into an awe-inspiring domain of intrigue and terror, a haunt of no return! You could talk to Garner Holt, who has built thousands of figures for all of Southern California’s major theme parks as well as casinos, museums, restaurants and retail stores around the world. This guy got started in animatronics from building his own backyard haunted house years ago, and now he wants to share his knowledge! This is just the tip of the coffin, there is so much more buried under the surface, go see! Here is the FULL SCHEDULE of classes and workshops at Scare LA, from how to carve tombstones to costume aging and distressing techniques. Learn how to make custom music for haunted attractions, attend a workshop on haunted maze design, see how to do casting and molding, make zombie prosthetics. There are even “Green Halloween” and “Upcycling your Halloween” workshops! Exhibitors will be showcasing their freaky stuff, there will be haunt experiences, roaming monsters, and a screening room with some great stuff on it from local horror filmmakers and premiere attraction previews! 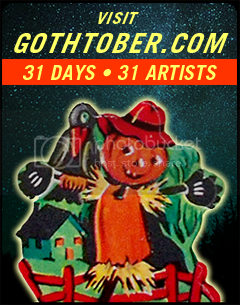 Halloween 35th Anniversary Blu-Ray-Hey-Hey The Great Gothtober 2013 Call for Artists!